With the improvement of camera functions and the increase of dependence on mobile phones, more and more iPhone users are keen on taking photos with iPhone camera to keep memorable moments. However, something unexpected always happens from time to time. What if one day your photos captured by iPhone 7 are lost? It will be a mentally challenging task for you to recover deleted photos from iPhone 7/7 Plus. Now, you can stop. Just take some time to learn 3 possible solutions here to free yourself. 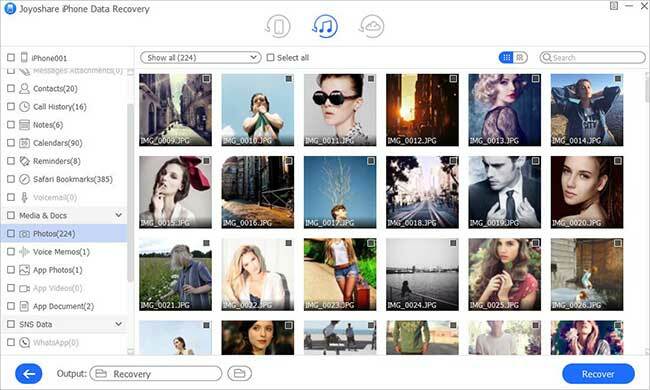 Joyoshare iPhone Data Recovery is one of the best options for you to recover lost photos from iPhone 7. It is fully compatible with all iOS versions, iOS 12 included, as well as various iOS devices (iPhone/iPad/iPod touch). 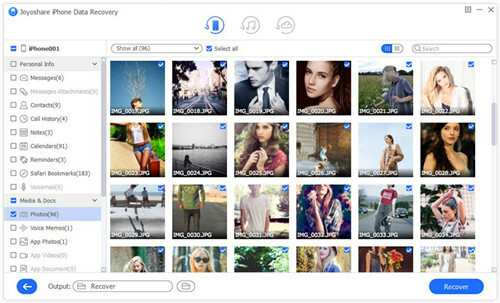 By using it, you are allowed to extract deleted photos from iPhone 7, iTunes or iCloud backups without hassle. Furthermore, this smart tool even provides you with real-time preview function to check all data you need before recovery. The one who feels like converting HEIC to JPG can also get benefit here. Truly in addition to photos, more iOS data types can be supported by Joyoshare iPhone Data Recovery, such as videos, notes, iMessages, voice memos, call history, contacts, reminders, Safari bookmarks, Kik/Viber/WhatsApp attachments, etc. You can go straight to follow 3 steps below if your iPhone 7 or iPhone 7 Plus can be detected and recognized by the computer without problem and you also would like to get the deleted iPhone 7 photos back without backup. 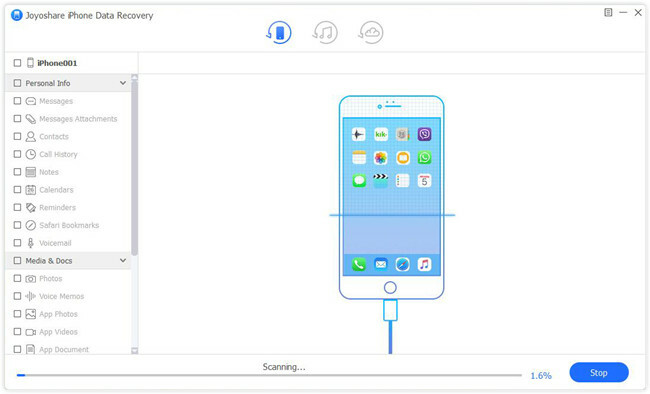 Download Joyoshare iPhone Data Recovery from its official website and get it installed. 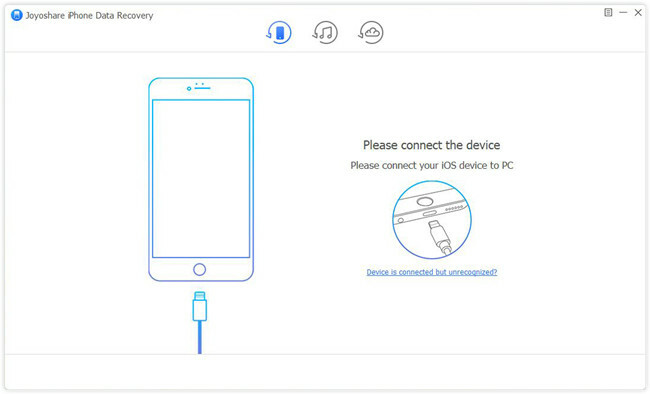 Then run it and connect your iPhone 7 to the computer under "Recover from iDevice" mode. After this program recognizes your iPhone 7, you can have a right to check all device info in the left and get to know the supported data types in the right. Then go to select "Photos" and click the "Scan" button at the right bottom. A list of photos scanned from your iPhone 7 will be shown orderly. Preview them in the way you like, simply select all or just mark whatever you need and then simply press the "Recover" button to start retrieval. If you have backed up your iPhone 7/7 Plus data to iTunes before photo loss, you can get them off one selected iTunes backup in just 3 simple steps. 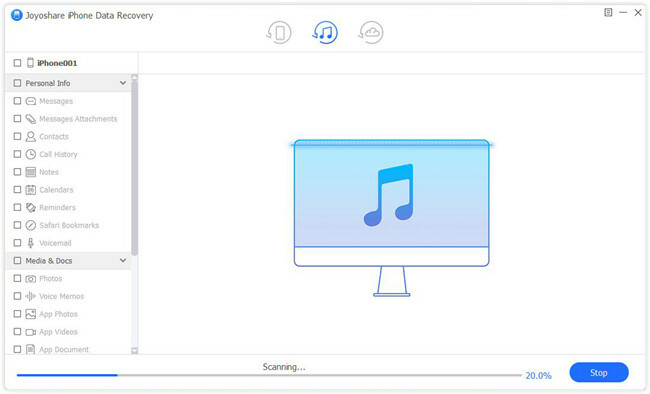 Step 1 Set mode as "Recover from iTunes"
Download and launch Joyoshare iPhone Data Recovery on computer. On the top navigation bar, choose "Recover from iTunes" mode this time. There is a list including all iTunes backups that have been synced to your local computer before. You can use the "+" button to import backups from designated folder or have a "Refresh" in your own way. Select one iTunes backup you want, confirm data types with its "Setting" button and tap on the "Scan" button to begin scanning. Once the scanning process is finished, all recoverable photos and more data will be classified and presented in different categories. Have a preview, tick needed photos and hit the "Recover" option to output to computer. 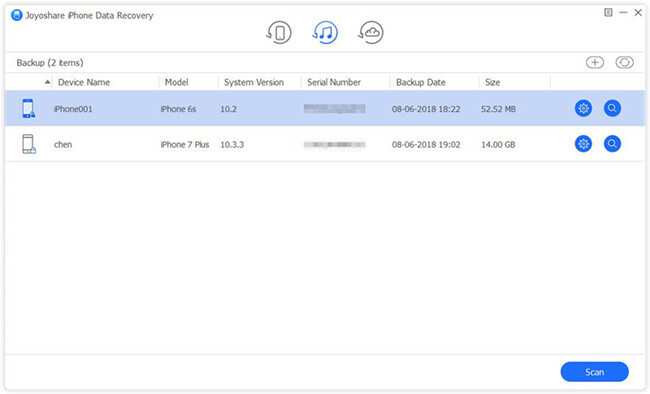 As long as you have synced and stored your iPhone 7 data, the deleted photos included, to your own iCloud account, you can have one more chance to get them back. 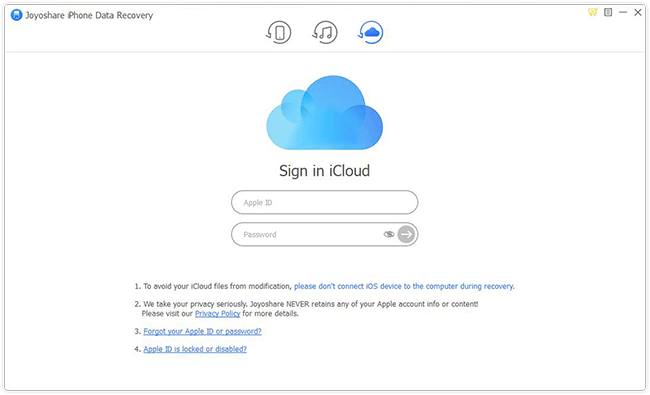 Open this iCloud backup extractor on your computer and get to log into the iCloud account under "Recover from iCloud" mode. Put the random code if your iPhone 7 has enabled two-factor authentication. 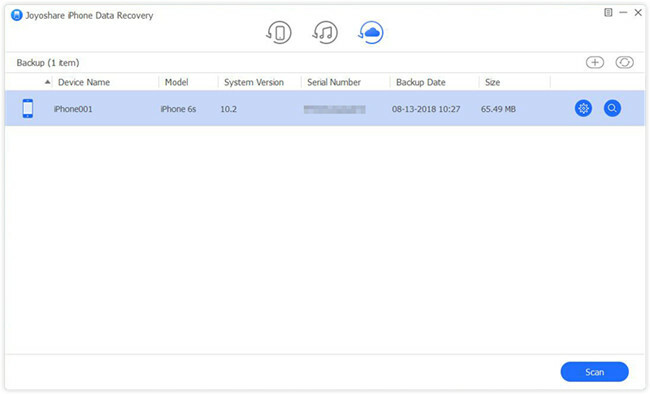 Your created iCloud backups will be shown with detailed info, like model, system version, serial number, backup date, etc. According to the info, you can pick up the most relevant iCloud backup to download. Then press its gear icon to select data types and click the "Scan" button to have a scan. Filter out unnecessary items or have a quick search. 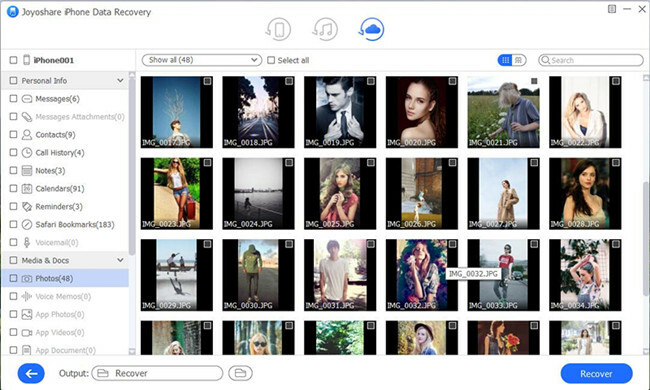 Preview the scanned photos in real time. Check carefully, choose the desired items and press on the "Recover" button to save on computer.